Last year, Will repeatedly came home from school requesting “eggies” for lunch. Aside from being clearly somehow related to eggs, I had no idea what he was talking about. I tried to have him describe the eggs he wanted, but I was just baffled. Finally, I emailed the mother of the girl who was bringing the “eggies” and asked what they were. Hard-boiled eggs. Who knew? These days there are a lot of eggies in our house. We eat them a lot — on salad, chopped in sandwiches and all sorts of things. In fact, the kids had them for breakfast today with clementines and toast. Based on their clean plates and excited woots, I think they liked them a lot. But these eggies on an open-face sandwich? They are all for me … just don’t tell the kids. Oh, but we don’t call them eggies. That just seems silly. It’s Eat. Live. Be. Reboot day and this week we are turning to the internet for inspiration. Or was it magazines? Depends who you ask. We’re having a little trouble keeping these things straight. Anyway, whatever our theme was, the ELB girls have some great posts up already. Cate wrote about confidence — and the importance of taking care of you first. Joanne is talking about the dreaded (but missing) January Joiners and a mouthwatering Thai recipe. Patsy is chatting all about the veggies and one of my favorite cooking magazines — Cooking Light. As for me, I’m the straggler this week. It happens. My internet inspiration this week comes from a sign I ordered from Etsy recently. It bears a quote that I hold near and dear to my heart: Life is not measured by the number of breaths we take, but by the moments that take our breath away. I discovered it shortly after my friend Elayne passed away. It speaks to leading a happy, well-lived life, which is something that I want to do more than anything. It’s about not wasting time with things that don’t matter. It’s about really living — and not saying no when the nerves threaten to boil over. It’s the motto I live by. Now, I just need to find the perfect spot to hang it. I’m thinking the kitchen where I will see it a lot. Oh hey, let’s not forget this sandwich too, which is totally worth the late night post. 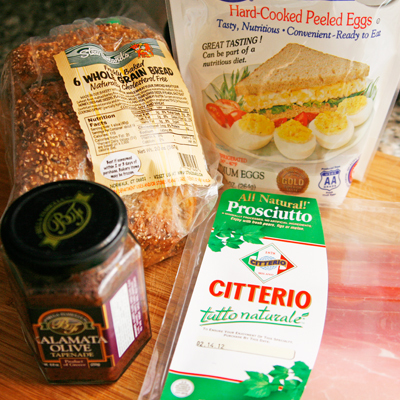 I first made this with chopped kalamata olives instead of tapenade and ate it for breakfast. Honestly, you could do it that way as well. Still I have to tell you that the tapenade spread really gets that salty, briny kalamata flavor everywhere, permeating every bite. It’s delightful. 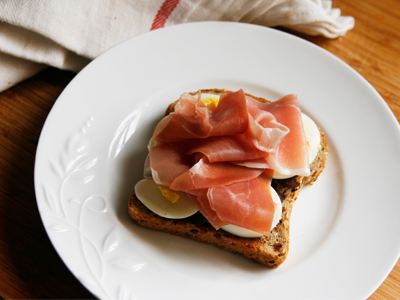 This makes a great open-face sandwich for lunch … or whenever. It’s a cinch to make too, which makes it perfect for whenever. What do you think? Is it breakfast? Lunch? A good sized snack? P.S. Apologies to any subscribers or feed readers who received an earlier version of this. I mistakenly hit the wrong button and the post published way too soon. Sorry! Toast the bread until golden. Spread with tapenade and then lay the hard boiled egg slices on top. 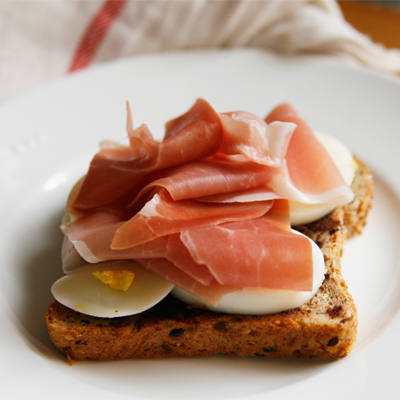 Drape the prosciutto over the egg. Enjoy! I really need to keep hardboiled eggs on hand. They’re perfect for so many things. I buy them already hard boiled. It’s a little lazy, but worth it since I really like them but rarely have time to actually make my own. With an apple on the side I would ABSOLUTELY call this lunch! And I love that quote…quality over quantity in all things. Sigh…I really though this week was magazines and I think that’s what we started with. For some reason I though we had described it as “online” instead of “internet”, which would make it after magazines. I’m just confused lol. I so want these open-faced “eggie” sandwiches! Yum! and, that sign you got… totally need that as well, it says so much about how we should live our lives.